Before we get started today I just wanted to let you guys know I'm judging for the CSI Project this week. So, if you have a great Knock Off you've done be sure to head over and enter your project on Thursday! Alright...on to today's project. I have a nephew who absolutely LOVES monkeys. I couldn't find the cool Paul Frank shirts in his size at the time so I thought I'd make him one instead. I also thought the monkey needed some wild shades. Here's how it went down. 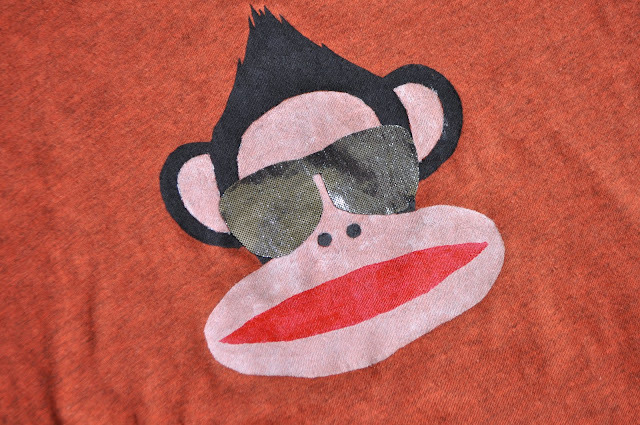 I printed out the monkey and did a freezer paper stencil. If you've never tried it before you can watch my video tutorial HERE to learn how. I used my Tulip soft fabric paint. I was torn between adding giant googley eyes and reflective sunglasses. The sunglasses won. I used this super cool new product - Aleene's peel and stick sheets. It's basically like fabric glue without the mess. I cut out some shades the right size on paper. Then I traced that pattern onto the sticky sheet, which has paper on both sides with the glue in between. I peeled up one side and stuck it to this reflective fabric I had leftover from making superhero capes. Then I trimmed the fabric to match, peeled off the backing on the other side and stuck it to the shirt. That's it! You don't even have to iron it. It seriously works too. The shirts been washed several times and the glasses are still on. I was really excited because this fabric isn't an easy one to sew. 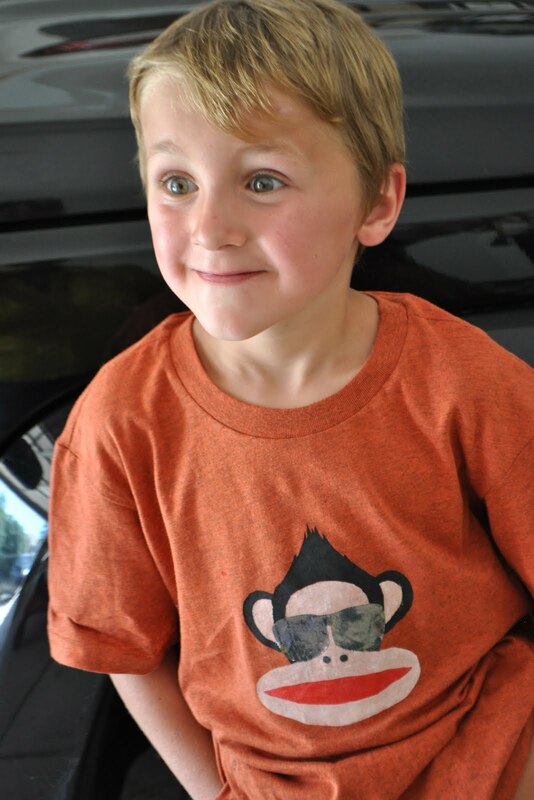 Now my nephew has a shirt in his size with the crazy monkey to fit his goofy personality. Wow! I simply LOVE IT. Well done. That is so cute! My oldest daughter would love it! THanks for the shirt. Goob loves it! Monkey man rules! Seriously, that metallic peel and stick is cute. Great job on the shirt. This is going on the list for my next Joann's coupon, for sure. You are pure genius! Thank you for sharing it with us! (side note--read your bio on CSI--I served a mission in Portugal too. Shoot me an email if you get a sec. I'd love to know when and where. That is so cute!!! I've tried freezer paper stenciling before, but never get such crisp clean lines! What is your secret??? Secret? Hmmm.....I'm pretty careful around the edges of the stencil. I like to brush from the paper to the shirt underneath when I do the edges. If you watch the video I linked in the post it might give you some more tips. i'll check it out! thanks Cheri!